With so many different options, selecting the proper field service management software for your business can be challenging. You may have heard of ServiceTitan, but what about other options? There are a number of alternatives, but we narrowed down our top five Service Titan competitors. Choosing software is never easy, but knowing which features are a must-need for your business and which aren’t is important. Don’t be afraid to take advantage of a free trial either. Multiple FSM software vendors provide this as an option. Through the use of real-time updates, FSM software alternatives to Service Titan allow for live communication between all users across a synchronized platform no matter what the device. ServiceTitan is a cloud-based, mobile field service management system for businesses of all sizes in industries such as HVAC, plumbing, electrical and garage door. ServiceTitan helps companies improve customer service and grow sales through the use of tools for tasks like scheduling, dispatch, invoicing, payroll, accounting and more. Although the cost is higher than some, its tools, integration capabilities and user-friendly interface make ServiceTitan a top option in field service management software. Not all FSM software work the same so it’s important to know your requirements and make sure the software you choose has the proper capabilities to meet them. Once you choose your FSM software, the same goes for choosing a price point. Most FSM software provide multiple pricing options; depending on the price point, certain features may vary along with the number of allowed users, so it’s up to you to compare those different price points and make sure you’re requirements match up. The industries Jobber caters to include, but are not limited to, HVAC, plumbing, maid service, computer repair, pest control and carpet cleaning. In addition to the United States and United Kingdom, Jobber is used by businesses in Australia, Canada and Europe. Small to medium-sized businesses are the primary users of this software solution. 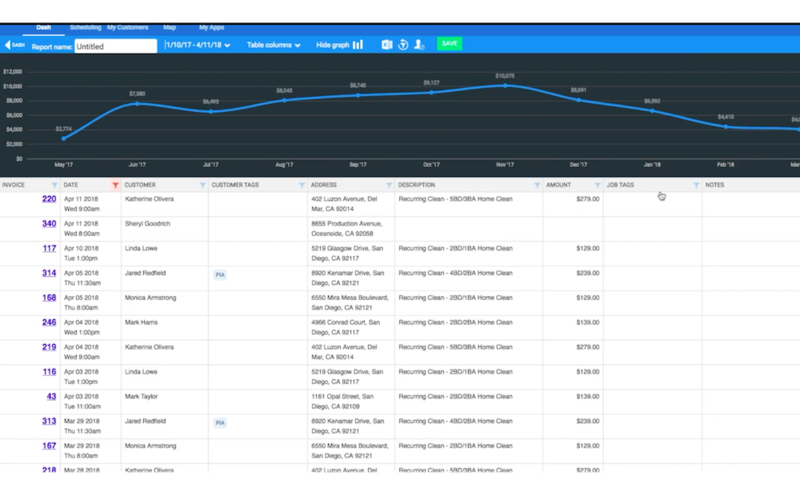 Jobber makes billing and invoicing a breeze while providing excellent customer support. 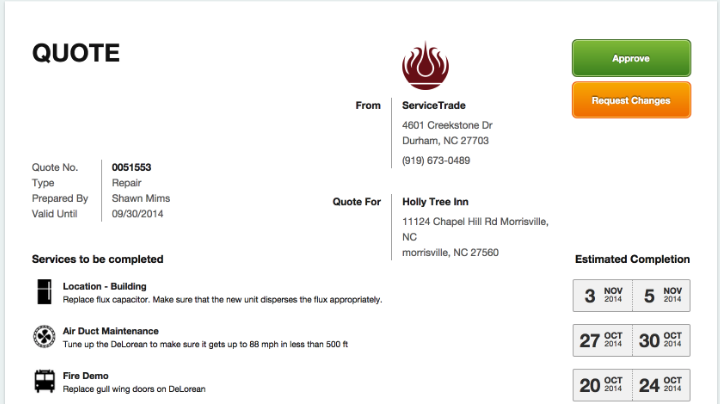 After finishing up a job, a technician is able to electronically send an invoice to the customer. Customers are also able to make payments online, speeding up the entire order process and eliminating the chance of forms getting lost in the mail. 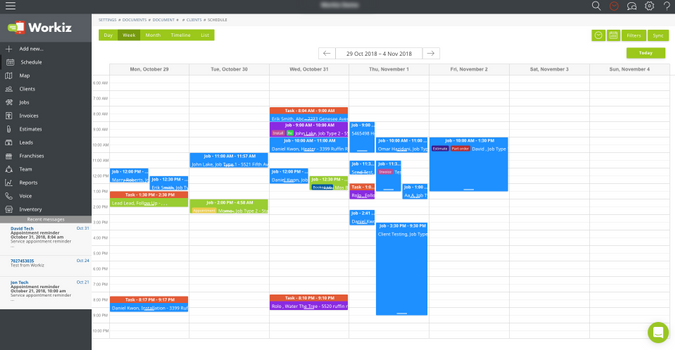 Jobber is easily integrated with Google Calendar, MailChimp, PayPal, QuickBooks, Stripe, Zapier and more, while its scheduling feature allows users to increase their organization and easily prioritize their day. Other features of the software include dispatch, invoicing, calendar, timesheets and GPS tracking. Along with a free trial, Jobber offers four price points. Keep in mind, if your business is considering software for the sake of managing inventory, Jobber is probably not your best bet as it offers zero inventory control. Housecall Pro is a field service management system for home service companies in the United States and Canada. Serving businesses in the industries of HVAC, garage door, carpet cleaning, pest control, window cleaning and more, primary features of Housecall Pro include live mapping, online booking, invoicing, scheduling, dispatch and automated marketing. With Housecall Pro, your business is able to view a customer’s history as well as automatically send emails and text messages to let them know when you should be arriving, what stage you are in the project and more. This system also speeds up the payment process by allowing customers to to pay online or with a credit card. When scheduling appointments, many customers prefer to do so online rather than through a phone call. Housecall Pro’s online booking tool makes it fast and easy for a customer to schedule available appointments, even after business hours. 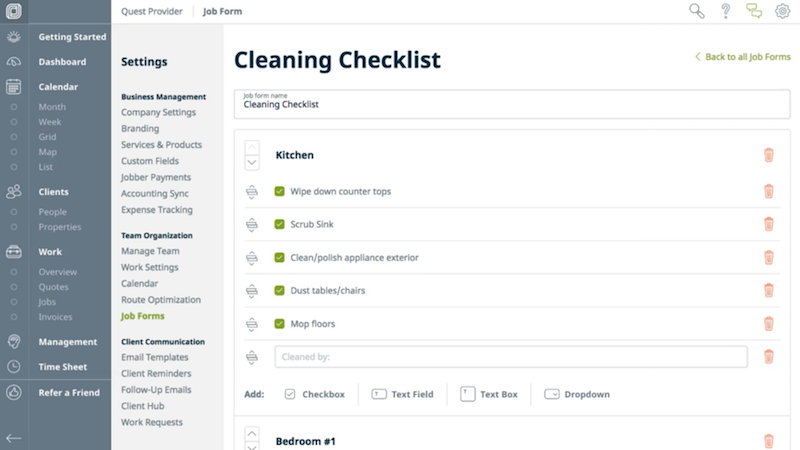 In addition, Housecall Pro automates estimates and invoices, saving you the hassle and time of doing so manually. The software allows anywhere from one to unlimited users with three price points depending on the amount of users. On the other hand, as a ServiceTitan competitor, Housecall Pro doesn’t offer much customization and has had issues with the consistency of platform features between devices (mobile and computer). For instance, a technician using a mobile device might not have full access to the same features as compared to the desktop version. MHelpDesk provides reliable customer support and allows for a moderate amount of customizable features based on customer needs. From the first point of contact up until payment, almost everything throughout the entire customer service process can be automated. In addition, the mobile app features an offline mode which allows technicians to continue using the software even when they are out of service range. 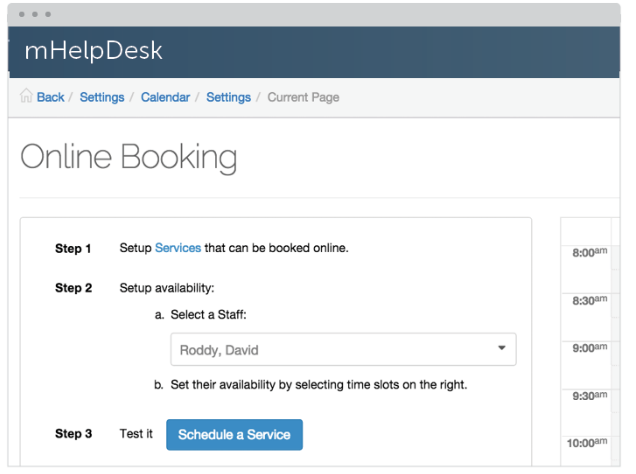 MHelpDesk is another cloud-based field service management solution for small to medium-sized businesses in industries such as HVAC, plumbing, lawn care, carpet cleaning, security system installation, computer repair and IT management. Features include lead management, workflow management, job management, scheduling, dispatch, estimates and quotes, and payment processing. One aspect of mHelpDesk worth noting is its phenomenal security and protection of data. Employees must go through an extensive background check and complete more than 80 hours of training before they are allowed access to customer data. By using the same level of security encryption as all major banks (256 Bits), data transmission between the user and servers is fully secured. MHelpDesk eases the process of converting to FSM software by helping you transfer old data into your new account. There are a number of benefits to using this software as an alternative to Service Titan, but if contract management is something your business focuses on you may want to consider something else as that is not supported. Another software that small to medium-sized businesses in industries like HVAC, construction, appliance repair, carpet cleaning, landscaping, roofing, IT services and more use is Workiz, a field scheduling software with tools for scheduling, invoicing, job management, client management, reporting and dispatch. What can Workiz do that ServiceTitan cannot? The main advantage is in the customization capabilities. From text messages and notifications to service agreements and signature requests, Workiz allows your operations to be fully customizable. For example, a user can customize, schedule and automatically send customer reminders and updates with full tracking. One of the biggest reasons businesses prefer Workiz has to do with how easy it is to use. The level of customization combined with the simplicity of the interface make collaborating with field technicians a breeze.  On top of that, Workiz includes local phone numbers as well as 24/7 support at no additional cost. One area where Workiz lacks is in its integration capabilities. Aside from QuickBooks and Stripe, no other integration is supported. Workiz offers three price points as well as a two-week free trial. ServiceTrade Commercial is a mobile field service management solution for commercial service contractors who work with small to medium-sized businesses in industries including fire protection, HVACR, commercial food equipment, pressure washing, kitchen exhaust cleaning and medical equipment. ServiceTrade works to include more customer involvement by providing real-time status, photos and job history. Technicians can take and add pictures when documenting job information rather than trying to provide a description which could be confusing to some. This provides more accuracy when communicating with the home office. For example, let’s say an electrician is working on a telephone line and runs into a problem they haven’t faced yet. Trying to describe what is wrong with a certain wire will be hard to do on paper. By documenting photos with a mobile device, a technician can save the time of writing out a description while improving communication by making sure everybody has access to see. Sometimes a picture can easily show the problem, whereas a written description could be interpreted differently depending on the reader. Along with the ease of use and access to job information, the software’s automation eliminates paperwork and double data entry, leading to increased productivity and efficiency in your business. One important thing to keep in mind with ServiceTrade is that, like Jobber, the software can’t handle inventory control. Additional features of ServiceTrade Commercial include service link, service portal, service review, business analytics, quotes, dispatch, scheduling, SaaS, integrations and accounting. ServiceTrade lists four price points on their website, including a free, Self Starter version with features limited to documentation and sending quotes. All paid versions allow for an unlimited number of monthly jobs. However, the Self Starter limits that number to 20. With so many field service management solutions out there, choosing the right one from our list of ServiceTitan alternatives can be confusing and stressful. You want to improve your business, but you don’t want to implement software that is too difficult to learn or navigate. Remember, not all FSM software systems are the same; it’s important to recognize your business’s specific needs and goals so you can choose a software that properly fits. You may find out that a cheaper software with less tools works better for your business. Why pay for a Lamborghini if you’re just going to drive it around the parking lot? Check out our field service management software comparison report to view more details on ServiceTitan competitors and how they stack up against one another. Does your business use one of the Service Titan competitors mentioned above? What are some other top alternatives? Let us know in the comments!